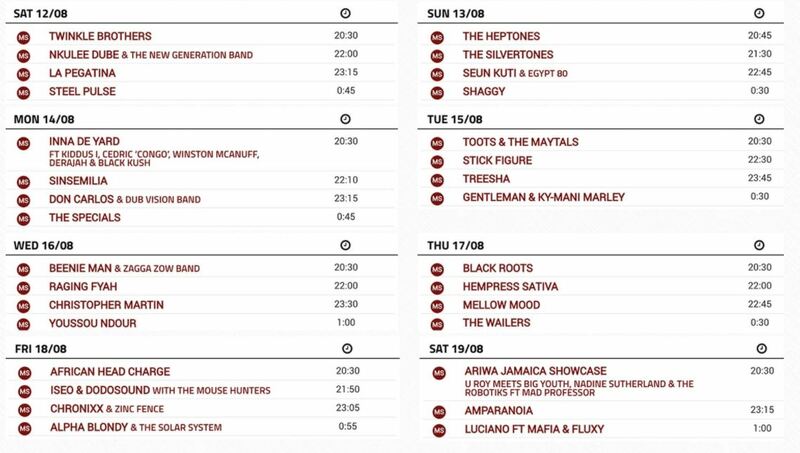 Rototom live stream schedule below and link to live stream on YouTube. Stream starts at 11:30 am Pacific Time each day. Thank you so much for the reminder. Great way to pass work a little faster. Man that Friday schedule looks awesome. Chronixx, Alpha, & African Head Charge in the same day? Sweeeeet! Love Raging Fyah!! Please bring them back! How good was that Rototom set chronicom420?! I was buzzing at my desk at work haha. Such a good vibe. Looks like they didn't get permission to stream Youssou N'Dour to close out today though. The other stages have been good too, when the stream is working. Really liked Cali P set yesterday. Also Mungo's Hi fi's set was great. Really like YT. Today's lineup looks good also. Looking forward to Bugle in the dancehall and then Lutan Fyah on the lion stage. Yea Spear burning that Raging Fyah set was the best hour at work I can remember in a long time! Edited 1 time(s). Last edit at 08/17/2017 03:05PM by chronicom420. Thanks for that link SpearBurning! I'm watching the recording of Twinkle Brothers from yesterday. Great performance, they still got it! Now I'm watching African Head Charge. Pretty epic live dub! I've always wanted to see these guys live, maybe they can come to SNWMF some day?